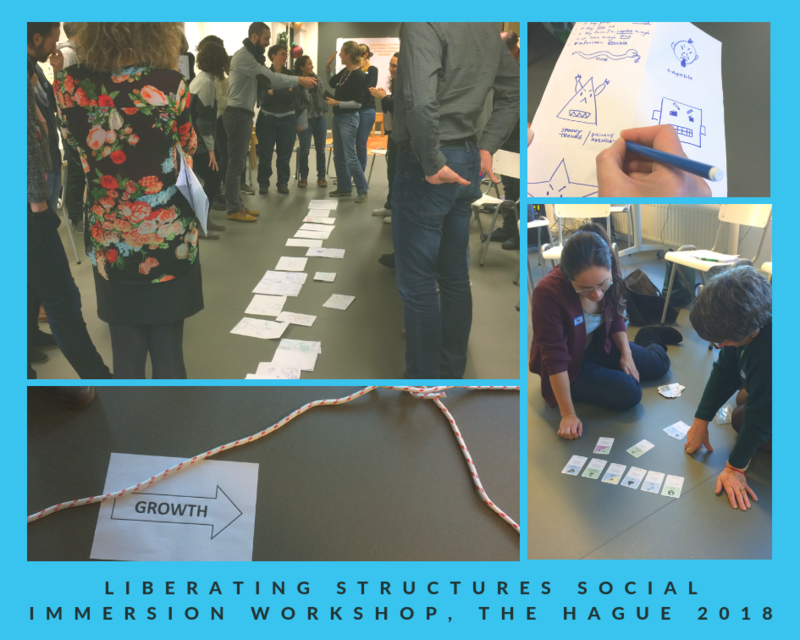 In December 2018, I was co-facilitating a Liberating Structures social immersion workshop jointly with Anna Jackson, Qua Fisher, Ewen Le Borgne and Cristina Temmink in The Hague. Our workshop was one in a whole series of the Eurotour Anna and Fisher undertook to bring Liberating Structures into the world and offer a first hand-experience to a wide range of people. I joined the team because the mission of Liberating Structures is also mine: Better and closer collaboration in teams, workshops and conferences, and the creative destruction of old meetings habits. Liberating Structures offer a set of structures (I also call them methods, activities, interactions) based on inclusive and distributed design principles. Liberating Structures have the potential to flip the way we collaborate, reflect, share and learn. I am definitely a Liberating Structures enthusiast. In this blog post, I share some observations from this experience. Liberating Structures are connecting. 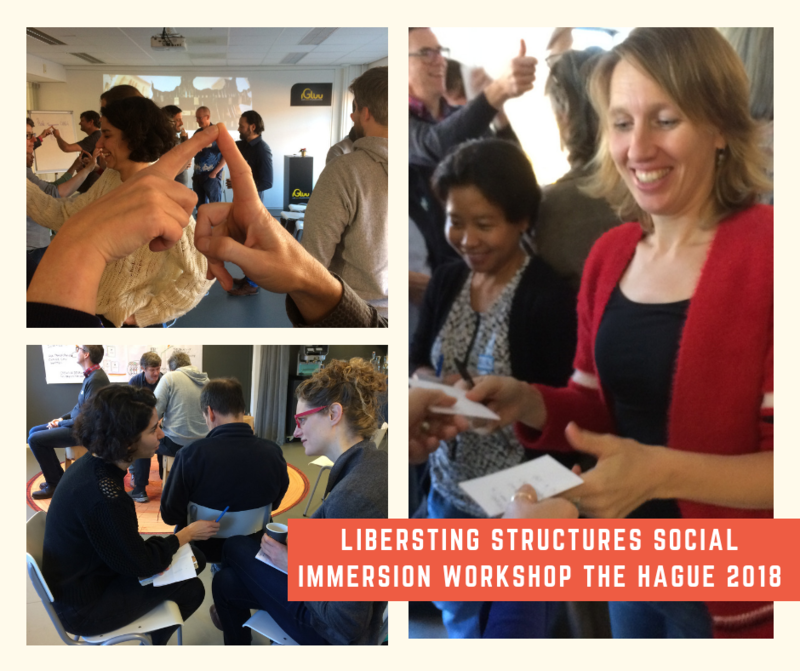 ‘We did not have a proper introduction round of all the participants, but I met and exchanged with everyone.’ These words of one of the participants illustrate nicely in which spirit a workshop based on Liberating Structures is organized, everyone is included and engaged all the time. Participants are working right from the very first minute together. ‘People first’ also means everyone has potential, everyone has a voice and valuable experiences that contribute to finding solutions together. –> Liberating Structures is not about structures it is about people developing solutions in close collaboration. Thinking back to our workshop in The Hague, I see the whole group in movement. Actually we were moving all the time. Again, and again. Groups are re-mixed, so are ideas and perspectives. In Mad Tea participants were rotating in two concentric circles, standing in pairs across from each other, face to face and reacting to prompts, then shuffling. In Troika Consulting, participants were turning chairs for better listening. In 25/10 Crowd Sourcing the whole group was walking. My personal favorite was the walking version of the Ecocycle Planning. Liberating Structures are bodily. Moving boosts brain power, supports the changes of perspective and stimulates fresh and agile thinking. –> In Liberating Structures people are not stuck to chairs nor to groups. Going through the photos from our The Hague workshop, I see the whole group in conversation. 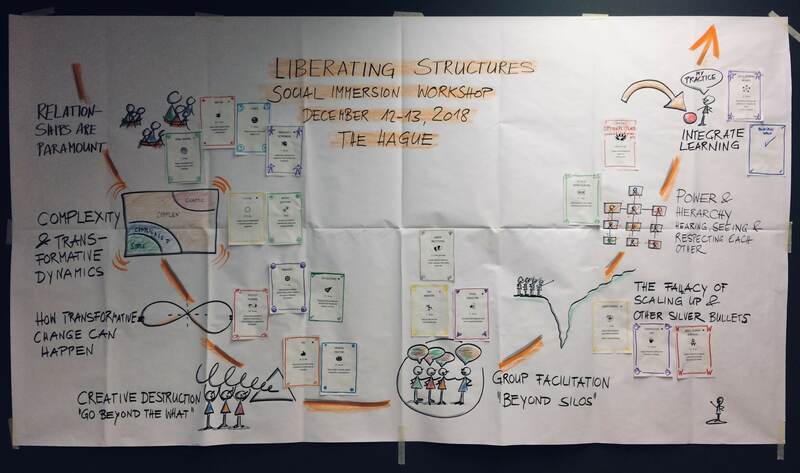 Participants explore through the structures how group facilitation can be re-invented through Liberating Structures. Liberating Structures create a different kind of workshop and transform the whole process of collaboration into a more open, adaptive and distributed one. A liberated approach. Everyone has a voice, everyone has influence in the process and the content. Exactly this was our plan as design team, to approach the two days’ workshop with an open mindset, well prepared with options for co-learning, co-designing and co-facilitation. For myself, I keep exploring Liberating Structures. The more I dive in, the more I discover what transformational power Liberating Structures has on collaboration and learning. In many workshops, learning events, meetings, I see potential for a more open, inclusive and shared process. For my own future workshops and advisory work I will not only apply a more liberated approach of planning and designing, I also want to inspire others with the Liberating Structures mindset. –> Liberating Structures is a shared approach that fosters inquiry and process thinking. … I was wondering about your journey – is there a deliberate connection to “Scharmer’s” U – did you refer to it in the preparation process?